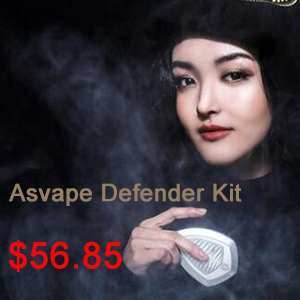 Augvape is generally good material and is no exception with this Intake, a rebuildable atomizer , simple coil , intended for the moderate aerial vape, while promising a total absence of leakage through an air intake from above. It is a question of taste, certainly, but all the same, the proportions and the design of Intake show little grace. It is cons remarkably well made, and suffers no aesthetic or functional defect. His threads are precise. 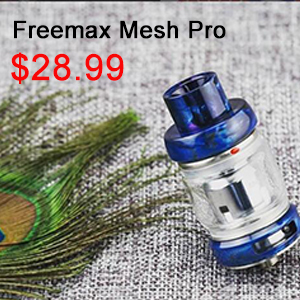 It is equipped with a standard drip tip blue standard 810, very thin and soft. 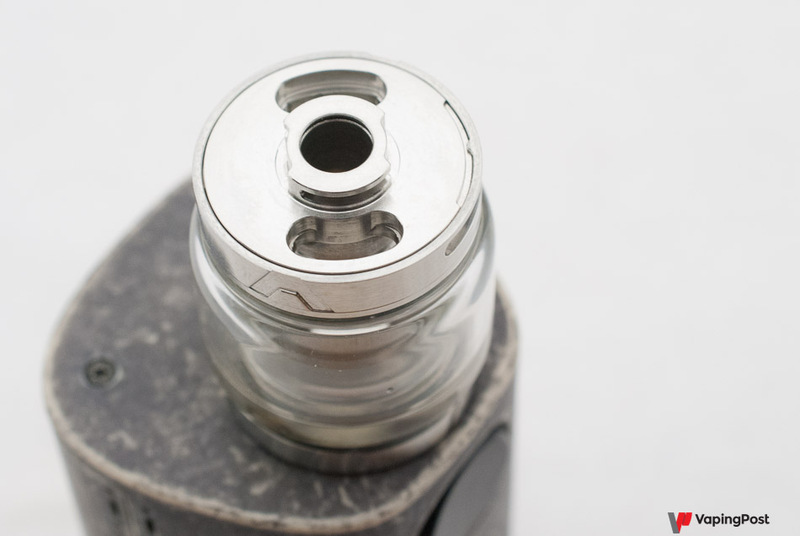 Another drip tip, black and higher, is supplied in the spare parts. 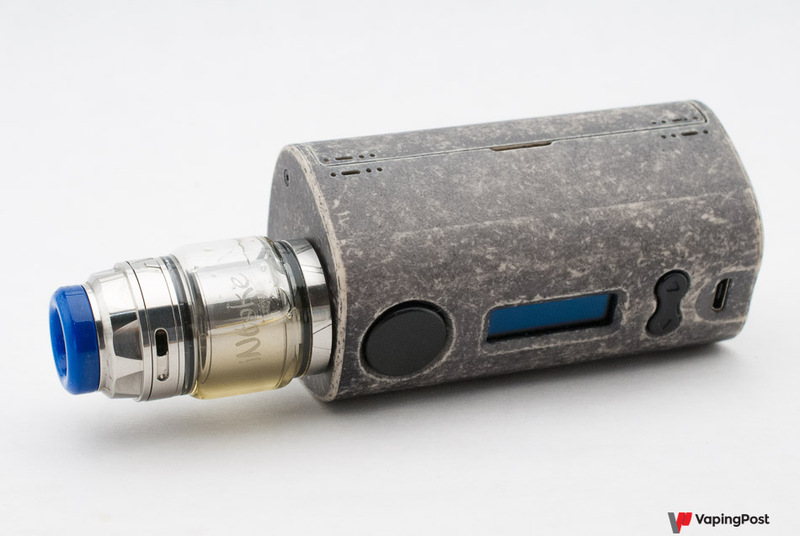 It is scratched by the master Mike Vapes ( American reviewer of his condition), which we will not know if he actually participated in its development or if he simply put his signature in exchange of some subsidies (well deserved, no doubt ). 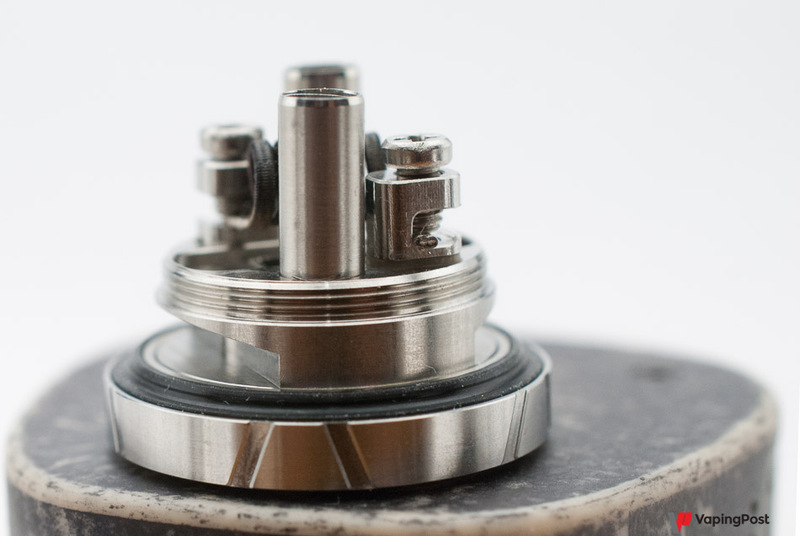 This image also shows a detail of the finishing quality: a very slight chamfer around the base makes it possible to mark the boxes less by screwing the atomizer on it. Moreover, the connector 510 is neither adjustable nor removable and this is not a fault since, firstly, all the boxes are now equipped with a spring pin, and secondly, the consequent impossibility to dismount the base is not a problem, even for cleaning: the base is designed for that. The tray is equipped with two fixing studs and two columns that fetch air at the top of the bell to bring it under the coil. 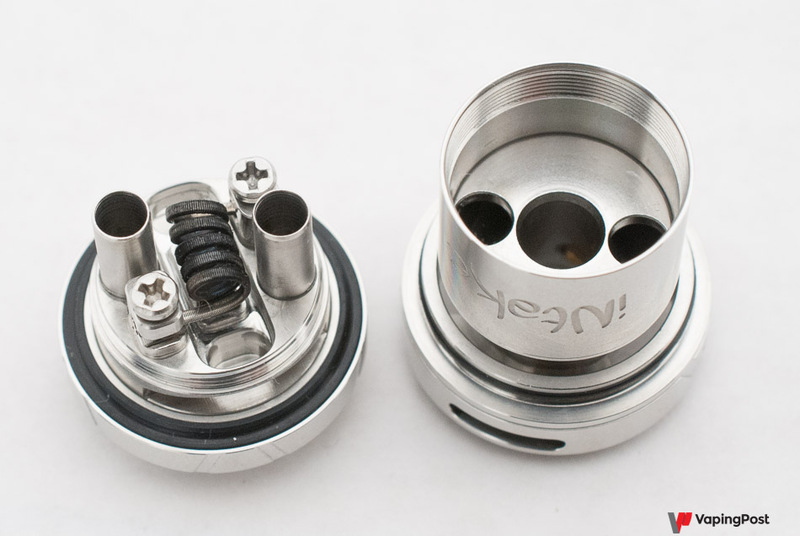 This system is efficient, can be noisy, and more practical when reassembling than the Zeus RTA Geek Vape for example. It also limits the flow of air, which, whatever the opening of the air inlets, will be restricted by the diameter of 3 mm of the columns. In the end, the Intake proposes an inhalation only direct, but slightly restrictive, say half that of a Zeus. The air rises on the coil through a grid of three oval holes, which water well coil. In this picture, we also notice how the liquid is directed towards the cotton, through a reserve dug in the mass of the base. The mounting studs are accessible, it is very easy to position the coil and fix it. 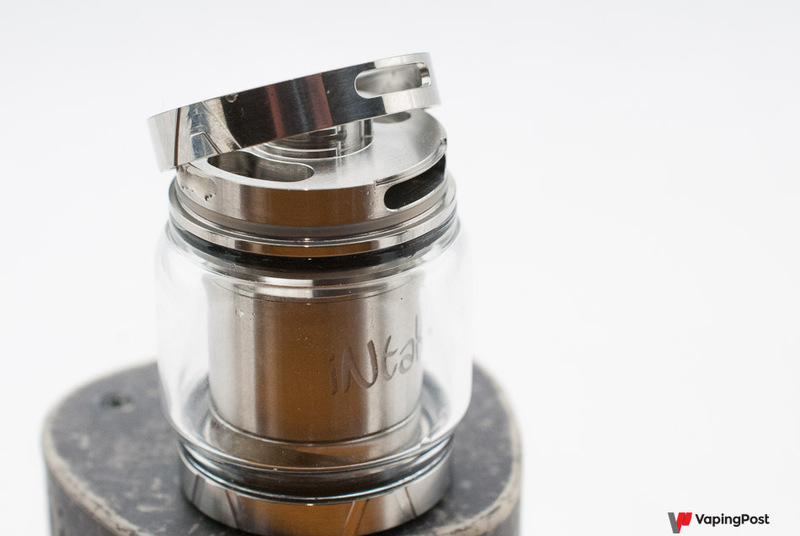 The Intake can be a good choice to embark on the rebuildable. 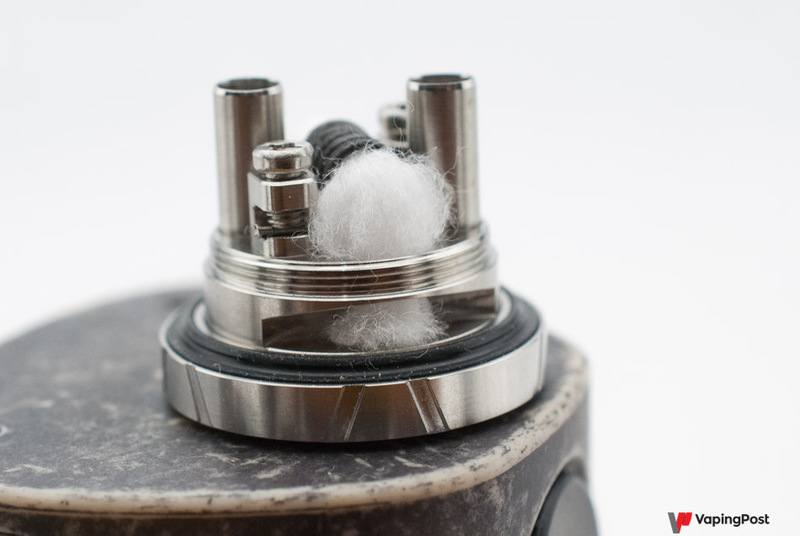 The pads are particularly well thought to use flat wires, here a fused nichrome clapton , for a value of 0.35 ohm, which befits the range of vape of this atomizer. The laying of cotton does not pose any difficulty. It is possible to let it pass in the reserve, or to cut it short, according to the taste of each: I think it makes no difference to the use. 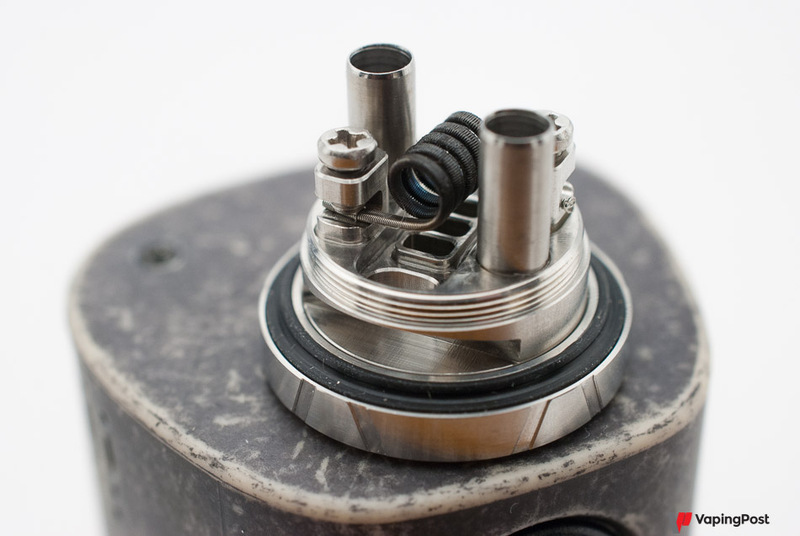 Moreover, if I mounted here a fused clapton , the Intake also works very well with single son in 0.4 or 0.5 mm. The production of steam is in this case a little diminished, but remains abundant, the coil is more reactive and the steam is a little less hot, which I prefer to vape fruity or fresh liquids. The choice of yarn is therefore a matter of taste. The airflow adjusting ring slides on an O – ring: it resists just what is needed to not get out of order while remaining easy to handle. 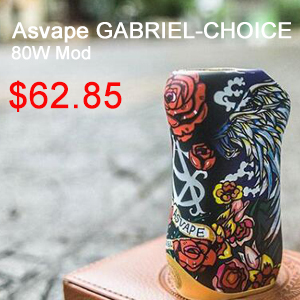 This airflow adjustment is a little symbolic, and Augvape could have dared the impasse. Indeed, the two air guide tubes on the plate already restrict the flow of air, and it is necessary to close the ring by at least 2/3 to begin to feel a greater restriction, which does not present that little interest. 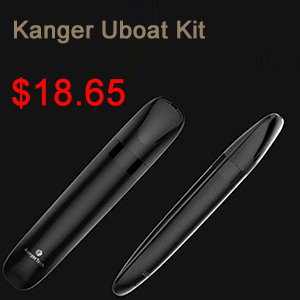 The Intake is at best with the air inlets open thoroughly, it feels good to the vape that it is its optimal point of balance. The filling is done from the top, and we guess that the top cap is fixed not with a thread, but with a bayonet system, faster and convenient. 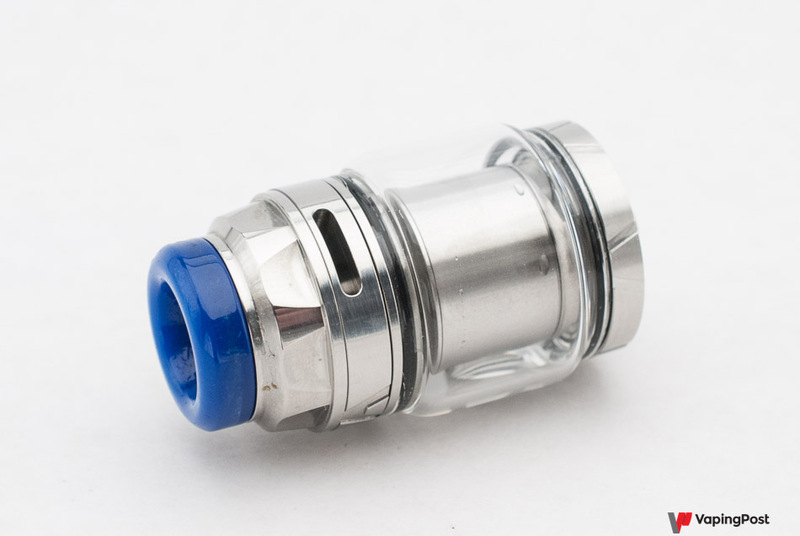 This is the main feature of this atomizer. It’s been a few years since the builders are trying to design atomizers that do not flee, positioning the airflow up, OBS in mind I think it. But it caused them a lot of technical problems, to guide the air and avoid unpleasant agglutination. Above all, the results in terms of flavors were not very good. This experimental period has passed, Geek Vape, Digiflavor, and now Augvape offer us successful atomizers, without leaks but not without flavors. It is not necessary to underestimate the other characteristics of this atomizer which, from 25 W, air flow wide open and with the coil presented here, offers a superb volume of vapor with liquids in 50/50, while remaining measured in terms of consumption. The flavors are frankly good, not as accurate as with a dripper dedicated to flavors, but related and pleasant. 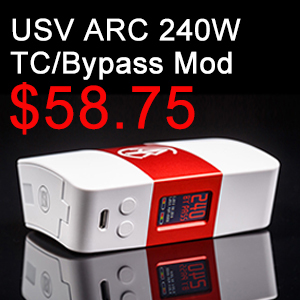 It produces a rather hot vapor, say warm to 25 W, but quickly warmer up to 40 W, which makes it suitable for the vape of greedy liquids, less to those of fruity or fresh liquids. The Intake is delivered in a black cardboard cylinder, usual with Augvape. The box contains the replacement seals, a straight pyrex, a black drip tip and a 510 drip tip adapter. I come back to the design, as I find it clumsy: it is a better atomizer that his look does not let it appear. It is practical and very well finished, but this top cap a bit coarse, and all these different diameters between the body, the tank in goldfish aquarium, the top cap and the drip tip … make it unbalanced, it gives the coup It is like being part of the family of noisy atomizers, when it offers a reasonable vape, rather fine, economical in liquid. Mr Augvape, launch your designers on a makeover of this ato, he deserves it! We noted that the base is not removable. This is not a problem for cleaning, except for the airflow circuit, in the tubes and under the coil. A little bicarbonate poured into the air guide grid, followed by soaking in slightly vinegar water is enough to remove traces of liquid and remove odors. 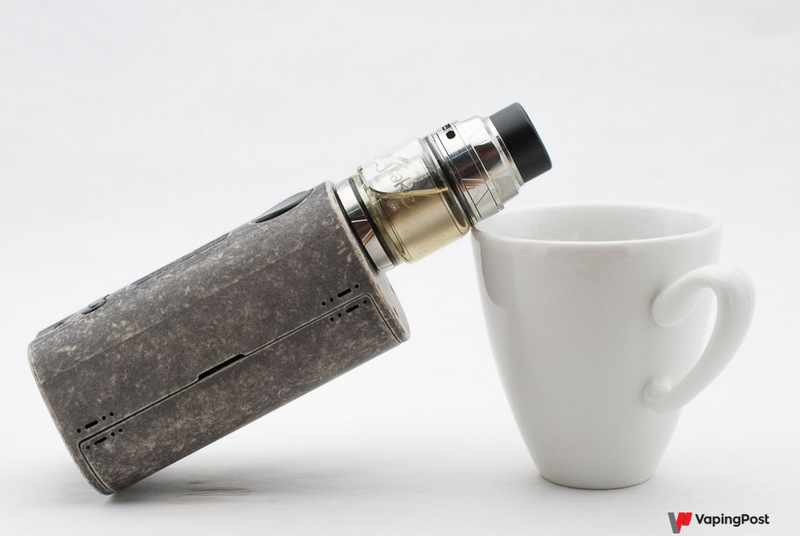 Beyond aesthetic criticism, the Intake brings many pleasures of vape: it is quite silent, it does not leak at all unless you leave it upside down for several hours, and its abundant vapor is faithful to the flavors of liquids. 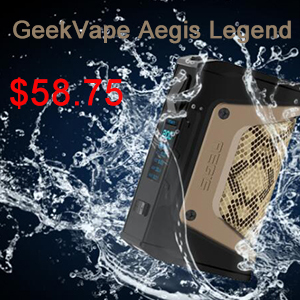 It is a good atomizer, equivalent to the Geek Vape Zeus, with a smaller airflow, and easier to mount. It is thus particularly suitable to begin in reconstructible: the laying of the cotton, always delicate to limit the leaks on its first montages, is here easy, and will not be able to generate leaks. Personally, even if its vape is not as subtle as some of my atomizers, I increasingly take Intuit, Zeus or Themis RTA Mesh from Digiflavor to work: the absence of leaks is a real asset when wants to look clean in the office or at a professional lunch. On the aesthetic level, I prefer it with its straight tank and black drip tip, more discreet. Apart from its somewhat crude design, the Intake has only qualities: flawless workmanship, good flavors, pretty dense steam, and no leakage . 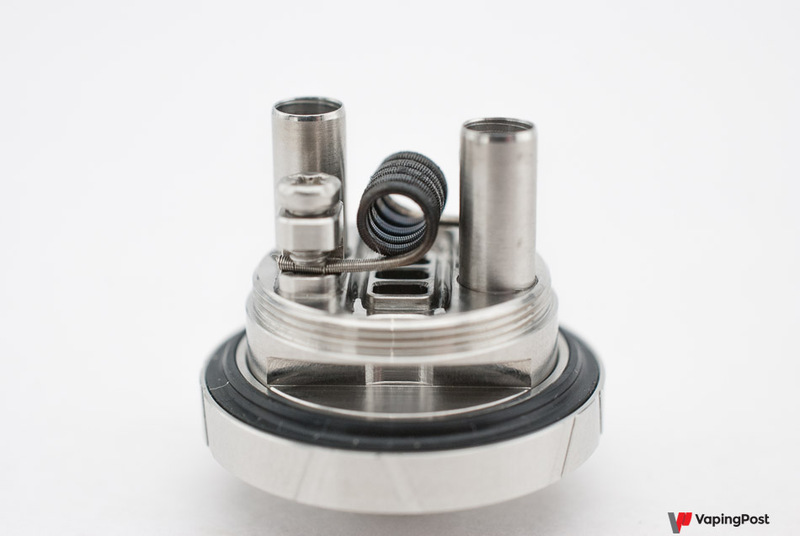 It is also very easy to mount, making it a good candidate for vapers who want to embark on the rebuildable. Good job. Next Next post: Liip by Digiflavor – “one-time vape” with a cool design. Maybe still go down?